When our daughter was younger she was really into The Bearenstain Bears books and cartoons. The books, if you have managed to avoid all 300 of them, dealt with single issues that were resolved generally through good ole-fashioned common sense, kindness and humor. Very formulaic and still much beloved by children. 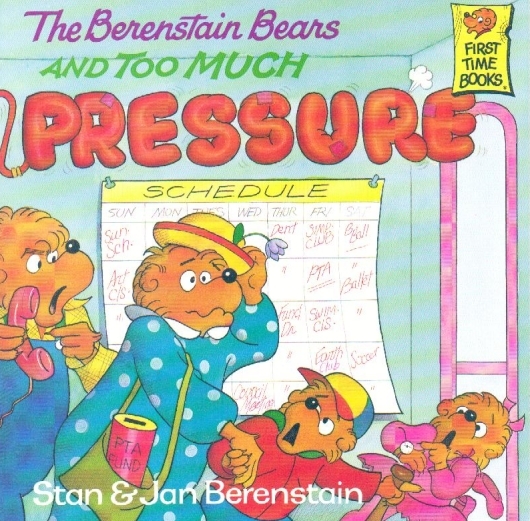 They had a habit of hokey titles even with modern story lines “The Berenstain Bears and Too Much .. Birthday… Homework… TV. “Too Much Pressure” is my personal favorite. Mama cries in a helpless heap when she gets a flat tire and can’t get Brother to Karate and Sister to Soccer at the same time. Personally I think its good for kids to see “wise, strong mama” break down and cry once in a while. As I try to finalize a workshop I am leading soon, I find that I am once again “Amanda Bear with Too Much Content.” There is so much potential in the conversations that unfold around the professional development work that I do that I start to think every concept is essential, every slide potentially life altering. And that’s just silly. I learned long ago to “be present” while presenting so the conversation is the driver and not the agenda. Of course some content is vital to the learning, but the discovery in the room prompted by the content is the goal, not finishing the deck with five minutes to spare at the end of the session. Until I’m in the room with the glow of 3,000 lumens, and the hum of the projector fan, I will suffer the agony of culling, curating and perfecting my content. The only Mama Bear that can save me from “Too Much Content” is time. It will run out and what I have will be more than fine and still too much. I don’t think PowerPoint workshop presentations are a good topic for a Berenstain Bears book but there may be one lurking out there for all I know. You can watch the Too Much Pressure cartoon version by clicking here.